Two more mainstays in my kitchen! I use these primarily for removing roasted chicken from the bone, for mixing ground meat or poultry combinations, or for anything where my hands would be hard to clean. They are absolutely necessary when I work with hot peppers that would otherwise burn my fingers. I started out catering and donning gloves while tossing salads with my hands and now I keep a box of medium sized gloves on my kitchen shelf-that way they fit most everyone in our family. I used to think these were exotic tools and now I see them in pretty much every kitchen store and grocery store I visit. I use the smaller of the two for limes or small lemons, and the larger takes care of larger lemons or oranges. Mixing drinks, adding lemon juice to culinary surprises, juicing oranges or lemons for fruit salad? These beauties can be used in so many ways and I find myself reaching for them almost daily. Note – once you cut your citrus fruit in half, be sure to place the cut side DOWN in the squeezer. It might seem more intuitive to place it cut side up as a half a piece of fruit settles nicely into the “bowl.” But be sure to turn it around – you get much more juice that way! The paint on these gadgets is wearing off a bit from the acid, so I always rinse them immediately after use, and if I were starting over I’d buy the squeezers that are not painted. They may not look as cute but they would last longer I am sure. 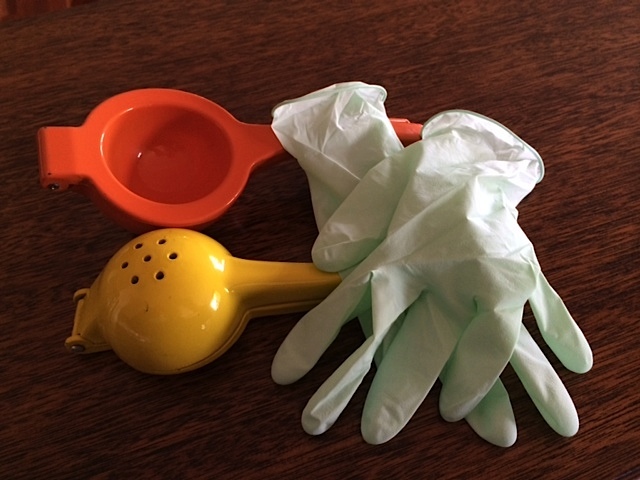 This entry was posted in Kitchen Essentials and tagged citrus squeezers, Kitchen gloves. Bookmark the permalink.